Stephen Theaker is a well-known figure within the British Fantasy Society – administrator of the British Fantasy Awards, reviewer, author, co-editor of Theaker’s Quarterly Fiction. 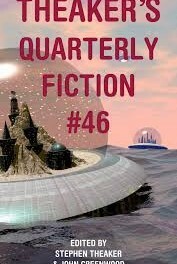 This 46th edition of the Quarterly Fiction is an eclectic mix of dystopian futures, steampunk-ish cybernetics, smuggling in space, mining for sorrow and talking planets. All highly readable, definitely leaving the reader wanting more from the authors. Mitchell Edgeworth’s Customs tells of a spoilt rich kid who build his own space freighter and finds his beliefs and values challenged when he becomes a reluctant pirate. Following the intriguing collection of tales are some reviews of books, films, audio books and television episodes, ranging from Doctor Who, to Star Trek, to Lovecraftian fiction – something for everyone to enjoy, and a more than pleasant way to while away some time. 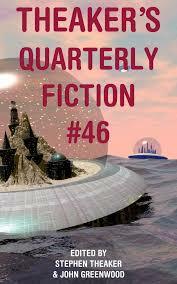 Theaker’s Quarterly Fiction is a great way to discover new authors, or find short tales from more well-established weavers of fiction.